In his provocative book, Ecology without Nature: Rethinking Environmental Aesthetics, literary ecologist Timothy Morton suggests that much ecocritical nature writing makes the same Romantic assumptions it seeks to critique. He posits that a properly ecological view of the environment must challenge aestheticised views of nature, and be immersed rather than observational. How can, and does, sound-based music ‘rethink’ environmental aesthetics? How can sound-based music, and writing on it, contribute to the ecocritical debate? · Soundscapes and sonic psychogeography. · Sonic activists, eco-activism in sound art and sound-based music. · Field recording projects that address issues of ecology, environmental stewardship and sustainability in the light of collective, or personal, experience of sound in the world. · Sound-based music as the ‘transliteration’ of recorded experience and memory of time and place. · Artistic projects arising from phonography communities and online dissemination of both music and materials. · Consciousness-raising, through sound-based music, in relation to listening and place. · Artist statements, personal and subjective, ‘listening in the world’. · Critiques and consideration of Acoustic Ecology. Submissions may consist of papers, with optional supporting short compositions or excerpts, audio-visual documentation of performances and/or other aspects related to your submission that can be placed onto a DVD and the CUP website for “Organised Sound”. 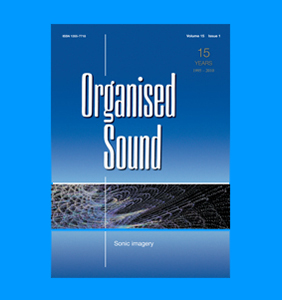 Supporting audio and audio-visual material will be presented as part of the journal’s annual DVD-ROM which will appear with issue 16/3 as well on the journal’s website.